Yes, I know what you’re thinking, what’s with that typo in the title? Isn’t it supposed to be bubble-wrap? The answer would be yes, if you’re thinking of two plastic sheets fused together, trapping air bubbles in between them, but not if you want to protect your Kindle for years to come, in which case a bobble-wrap would be a much better choice. The bobble stitch is an all-around favorite for adding texture to crocheted items and it’s excellent when you need a thick material that will protect one of the most precious items in your handbag. As I’ve said before, pampering your electronics is not a bad thing and could be even beneficial for them over time. This kind of event (oh, trust me, there have been more) makes me appreciate even more the care that can be offered by such an item as a nice and cozy Kindle case. I used what I believe is aran weight yarn (8 wpi or recommended for working with 3-3.5 mm needles), a microfiber yarn that has a bit of bounce to it, Contessa from Feria, a German brand. You can find more information about this yarn on its Ravelry page and find some suitable alternatives. The pattern should work with any similar weight yarn and should be especially sturdy with cotton. Around 100 meters (or 110 yards), or half of an 100 g skein. For a thick and sturdy fabric that will keep its shape, I used a hook smaller than the one recommended for this yarn, namely a 2.5 mm hook (between a B and a C for the US, you can use either one that works for your tension). 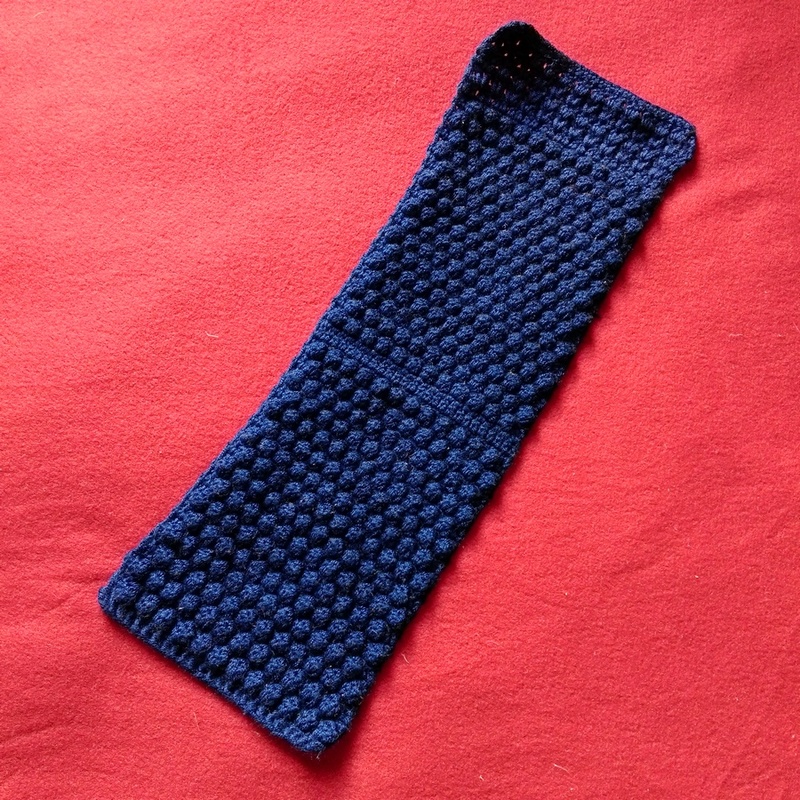 For a generation 8 Kindle (16×11.5×0.9 cm) the size of a swatch made of 10 sc and 10 rows should be 5 x 4 cm. For other devices, using the same basic structure, you can use a larger hook with a thicker yarn/smaller hook with thinner yarn or add/subtract multiples of two stitches per row. The finished piece is 17 cm x 13 cm (without the flap) and fits the Kindle snuggly (the thickness of the device makes it fit properly). Optional: two buttons for closing the top part of the Kindle case. Ch1 or Ch2 at the beginning of rows do NOT count as stitches and you should never work in them. Every row should have 26 stitches (except the last one in the flap). If you want an even thicker case, you can increase the number of dc in each bobble, but I find that three are enough to give that feel of bubble-wrap and not be extremely tiring. You may be used to doing Dc or Hdc instead of Sc in between the bobbles, but this method ensures that the fabric is thick and has a unique texture, since only the bobbles are visible. For the zig-zag placement I was inspired by this tutorial for the bobble stitch, except in this case there is no Ch1 after the bobble (3 dc cluster), so there are always just 26 stitches per row. If it’s easier for you to follow a diagram, here is one I created for you. If you want to share it, please link to this page, not the file location. If you’re more comfortable with detailed instructions, read below. Start with either a chain of 26 or 26 FSC. If you do FSC, it will be your row 1, so skip to row 2. Row 1. Ch1, Sc in same stitch. Sc x 25 (one Sc in every stitch). Row 2. Ch1. Sc in same stitch. [Bobble st. Sc ] x 12. Sc. Row 3. Ch1. Sc in same stitch. Sc x 25. Row 4. Ch1. Sc in same stitch. Sc. [Bobble st. Sc ] x 12. Rows 5-32. Repeat rows 1-4 for 7 times. Row 33. Ch1, Sc in same stitch. Sc x 25. Row 34. Ch2. Dc in same stitch. Dc x 25 (one Dc in every stitch). Row 36. Ch1. Sc in same stitch. Sc. [Bobble st. Sc ] x 12. Row 37. Ch1, Sc in same stitch. Sc x 25. Row 38. Ch1. Sc in same stitch. [Bobble st. Sc ] x 12. Sc. Row 39. Ch1, Sc in same stitch. Sc x 25. Rows 40-68. Repeat rows 35-39 for 7 times. Row 69. Ch2. Dc in same stitch. Dc x 25 (one Dc in every stitch). The first row of the flap is created with V-shaped pairs of Dc, using the spaces between the Dc in the previous rows, not the loops. 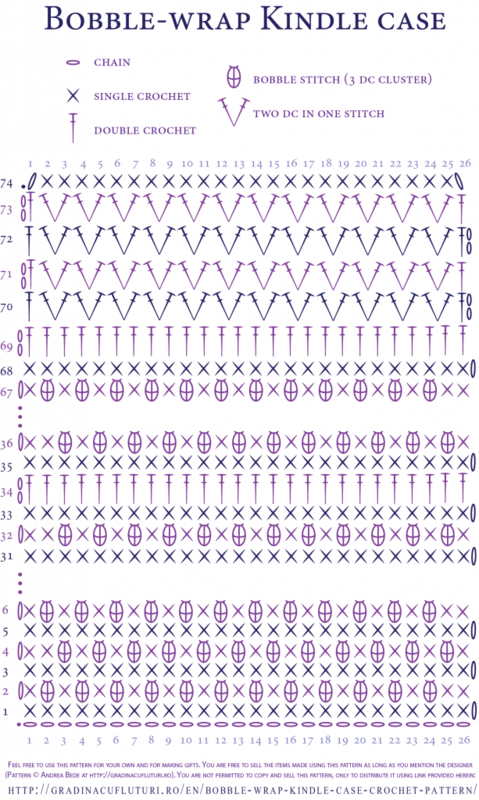 The next rows are worked in the spaces inside the V-shaped pairs of Dc. The last row of Sc is worked in the loops of each Dc. Row 70. Ch2. Dc in same stitch. [Skip 1 st, 2 Dc in next space between Dc] x 12. Dc in last stitch. Row 71. Ch2. Dc in same stitch. [Skip 1 st. 2 Dc in space between 2 Dc] x 12. Dc in last stitch. Rows 72-73. Repeat row 71. Row 74. Ch1. Sc in the same stitch. Sc all the way to the last stitch. Fasten off. Starting from the row of Dc that will form the base of the case, using the same yarn, connect the two sides using a slip stitch. One sl st in each pair of sc will give an even, elegant edge. Sew all the way to the flap. Wash the item by hand, in warm water, with gentle detergent, to remove any oils from your hands and to freshen it up. Lay on a flat surface to dry. If you want to, sew on a couple of buttons on the front of the case (sew them to the sc, not the bobble st). Otherwise, after putting the Kindle in its new case, tuck in the flap. for protection. That’s it! Your Kindle case is finished! I really hope you enjoyed this pattern. If you have any suggestions, corrections or ideas on how to use this pattern for anything else, please leave them in the comments section. I would love to see your finished objects made from this pattern. You may leave a link here or post a picture on my facebook page. Hi! I am looking forward to making my kindle cover, it’s very pretty! Before I do, could you please clarify is the pattern’s written in UK or US terms? Thank you! Hey, sorry for the late reply, your comment was unfortunately sent to spam by the overzealous akismet. The pattern is written in US terms, like all my patterns (I will add that detail to the text, thanks for pointing it out). I hope you managed to make it since writing. If so, I’d love your feedback.